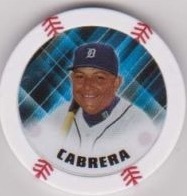 2015 Topps MLB Chipz are kind of like some poker chips and baseball cards getting together in some bizarro hobby world. Aimed largely at young and casual collectors, they might also appeal to player collectors looking to branch out from the traditional stuff. Like a lot of card sets today, 2015 Topps MLB Chipz come in a variety of colors. Basic versions are white, done in a way that mimics a baseball. Parallel borders come in Red (1:2 packs), Blue (1:4), Green (1:6) and Black (1:10). The rarest parallels are black-framed Chips that have a Red Foil sticker. These are inserted one per case. Also available are Gold Foil Sticker Chipz (1:10). 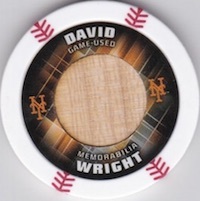 Adding a premium element are randomly inserted Relic Chipz that have a small piece of game-used bat embedded in them. Every pack of 2015 Topps MLB Chipz comes with four Chipz and a game board for those who want to play with them. Sweeter than baseball cards. Need to double up on milansing michigan shipments. I love the look and feel of these. The parallel chips are a nice twist. Bought a pack for my two year old tonight. He loved opening them and looking at them and playing with them. This was a great introduction to baseball collectibles for him without having to worry about ripping them up like cards. Tom Scardina >> And…..how, exactly, is that Topp’s fault that “some vendors send people to retail outlets to purchase products, and resell them at higher prices?” And how, exactly, does that justify a 2-star rating? I love this product I have almost every year going bro the 70’s and 80’s tin chipz!!! The kids love them. I wouldn’t put stock in these though. Also great to toss on the table on poker night.